Chinese President Xi Jinping and other top Chinese leaders visit a major exhibition marking the 90th anniversary of the founding of the PLA at the Military Museum of the Chinese People's Revolution in Beijing, capital of China, July 21, 2017. 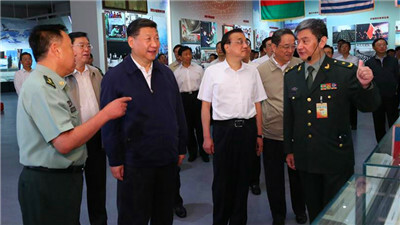 Senior leaders Li Keqiang, Zhang Dejiang, Yu Zhengsheng, Liu Yunshan, Wang Qishan and Zhang Gaoli, also visited the exhibition. 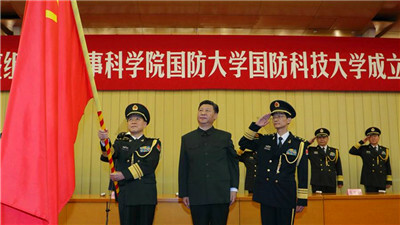 Chinese President Xi Jinping, also general secretary of the Communist Party of China (CPC) Central Committee and chairman of the Central Military Commission (CMC), presents the heads of the PLA Academy of Military Science with the military flag in Beijing, capital of China, July 19, 2017. 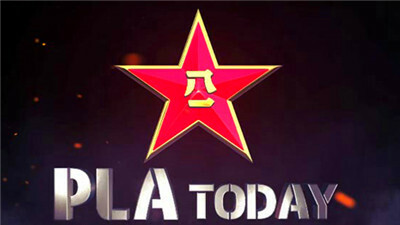 This year marks the 90th anniversary of the founding the PLA. The last nine extraordinary decades record a history of the diligent march forward under the leadership of the CPC, a history of serving the people with the resolute and capability to win, a history of starting from scratches to overcome powerful opponents with modest strength, and a history worth cherishing and commemorating. 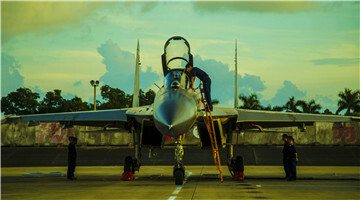 A pilot sitting in the cockpit of his J-11 fighter jet conducts last-minite check with the help of a maintenance man prior to the flight training at a military airfield in south China's Guangdong Province on July 12, 2017. 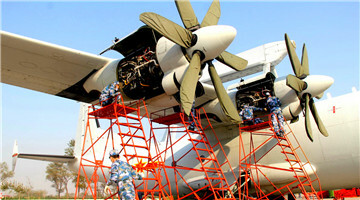 A group of KJ-200 AEW aircraft and a Y-8 aircraft for special EW missions sit on the flightline prior to the flight training at a military airfield in coastal area of east China's Shandong Province on July 11, 2017. 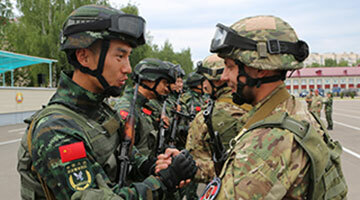 The United Shield-2017 joint anti-terrorism drill jointly held by the Chinese People's APF and the Internal Troops of the Belarusian Interior Ministry started in Minsk, capital of Belarus, on July 11, 2017. 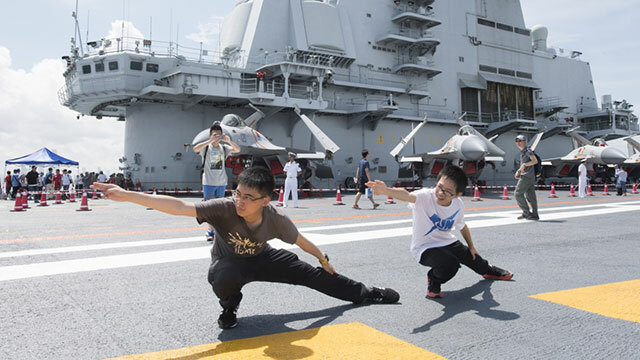 Young people pose for photos on the flight deck of China's first aircraft carrier Liaoning in Hong Kong, south China, July 9, 2017. The aircraft carrier Liaoning was open for the public to visit in Hong Kong on Saturday and Sunday. A soldier introduces the man-portable anti-tank missile system to a Hong Kong child on the camp-open day in the Ngong Shuen Chau Barracks. 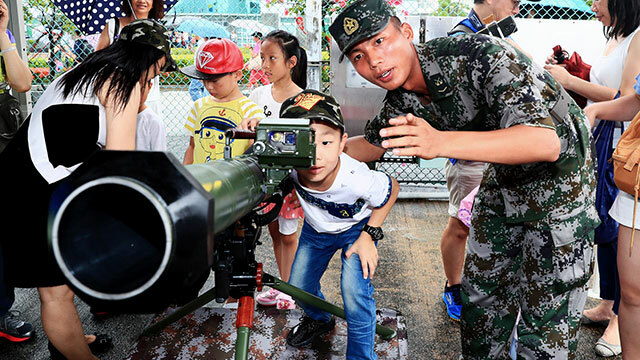 In order to celebrate the 20th anniversary of Hong Kong's return to the motherland, the Ngong Shuen Chau Barracks of the PLA Hong Kong Garrison held the camp-open day activities on the morning of July 8, 2017.